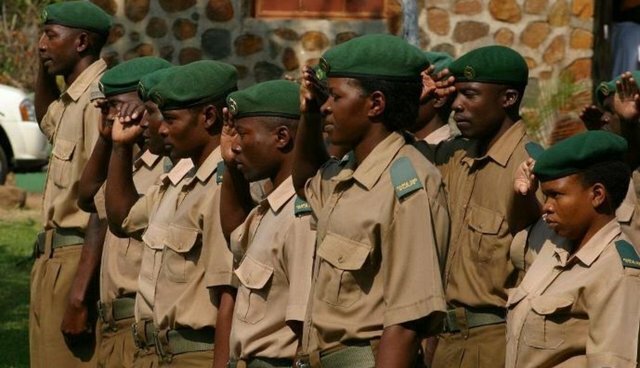 It takes guts, hard work and dedication to be a wildlife ranger in Africa. Most of us envision men clothed in camo, with a gun slung over their backs, stealthily treading through the bush on the lookout for poachers. Well it's time to give the women their due respect. 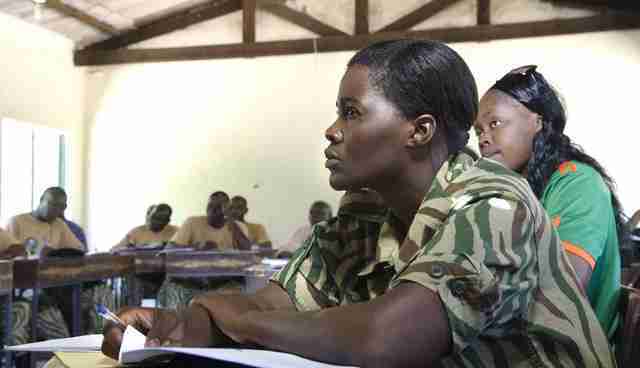 Although the minority, women play their part in the war on poaching as rangers and in anti-poaching units. What does it take to work with the boys? I asked my ranger friends for some help getting a woman's perspective. One connected me with this woman who for safety reasons has asked for anonymity, and is referred to as Bushmeerkat. What motivated you to want to be a ranger? Bushmeerkat: My motivation was simply there is so much bad in the world, and I wanted to do a good thing. I prefer animals above people and I love and adore rhinos. And if we don't start doing something about it and be serious, they're not gonna be here for my children one day to see, love, adore and appreciate. How long have you been with an APU? Bushmeerkat: I have always wanted to be a ranger, it's my love and my passion. I did it for fives months. The reason for the short period of time was the woman I worked for was a very rude scaly woman who owes loads of people loads of money. What obstacles have you faced in your career? And are any of them because you're a woman in a predominately male career field? Bushmeerkat: Obstacles: well one of them was I had to do everything ten times harder than the guys because I had to prove that I had what it takes and I can be proud to say I had loads of respect from all of them and visa versa. Physically it was a big challenge to not get left behind and do the exercises equally to the guys, but it was loads of fun, hard work, and lots of adrenaline to be part of a team, and for them to see me as one of the guys. Do you think women are starting to trend toward this as a career opportunity? 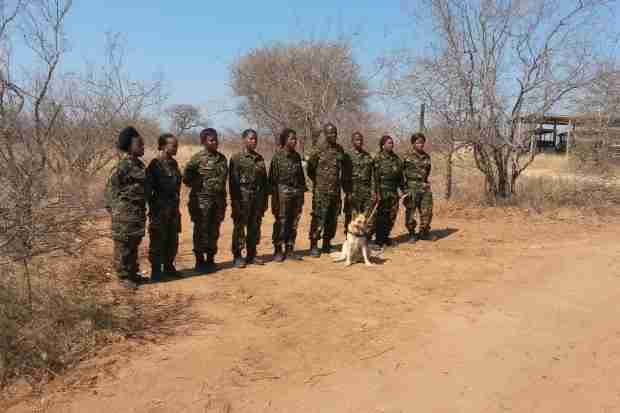 Bushmeerkat: Well, honestly I think lots of women confuse anti-poaching with game rangers. It's completely different and as far as I know I was the only woman to have done anti-poaching in South Africa. I think they're more tempted to do game ranging than anti-poaching. As a game ranger, you do game drives, work with tourists; you teach them a bit about the bush and the animals. Very little contact with poachers if any at all. With anti-poaching you live in the bush, you know the bush, you do daily tracking of animals, check fences and get contact all the time with poachers. You train the dogs and yourself as well. There's no interaction with tourists. Simply because you're a bush person. It's you, your team, and the bush. What advice would you give women considering the field? Bushmeerkat: My advice: to do it for the love of the animal, not to see how many people you can get in the bush. That ain't gonna work. And prepare yourself for war as we are fighting a losing battle. After some discussion, we agreed it was difficult to find many women involved in the field. I told her she came highly recommended. The rangers who referred me to her called her the "rock star of women in anti-poaching." She responded by laughing and saying, "I don't know how other people see me and I honestly don't give a f***. I did what I did from the heart, for a good purpose. I can't stand poachers or any kind of animal cruelty." She is currently working with horses in Limpopo, still getting her share of nature and wildlife, but said she hopes to get back into an APU again soon, as, for her, "it's not a job; its a lifestyle."